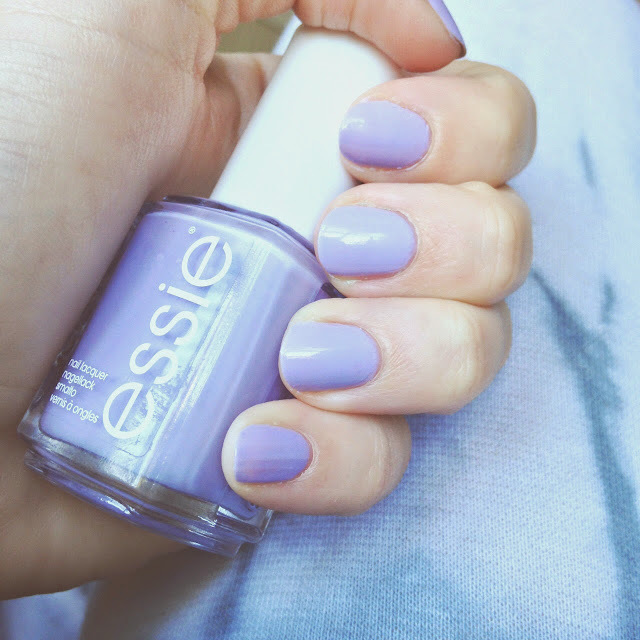 My go-to Spring nail colour is ALWAYS a pastel colour, be it blue, pink, green, yellow or purple. Something about them just says freshly mown grass/flowers blossoming/lambs leaping (too far?) to me! I think also for me, it's the perfect colour introduction to the bold corals, turquoises and hot pinks I like to wear throughout Summer. I recently picked up this Rimmel nail polish in 'Wild-er-ness' from the Rita Ora range as it was on a 3 for 2 deal in Boots and seeing as I was already buying a Rimmel foundation, I couldn't really ignore it, right?! I was also recently sent the colour 'Lilacism' from the Essie collection by the lovely Harpreet over at www.nail-buff.com - this is the first Essie nail polish I've ever owned so I was so excited to try it! The Rimmel polish retails at £2.99 whereas the Essie polish usually retails at £7.99. These two colours however, are very similar. So I thought I would weigh up the pros and cons of each polish just for you, you lovely reader! So first things first: application. I applied the Essie polish to my left hand and Rimmel to my right hand. Both polishes were noticeably easy to apply. The Essie nail polish definitely has a slightly smoother formula. I think this formula is slightly thinner than the Rimmel one but yet the colour payoff is incredible. Both were slightly streaky after the first coat but this is to be expected. Both were also very quick to dry which I LOVE about a nail polish (I am a very busy woman after all). I put three coats of each nail polish over my nails. 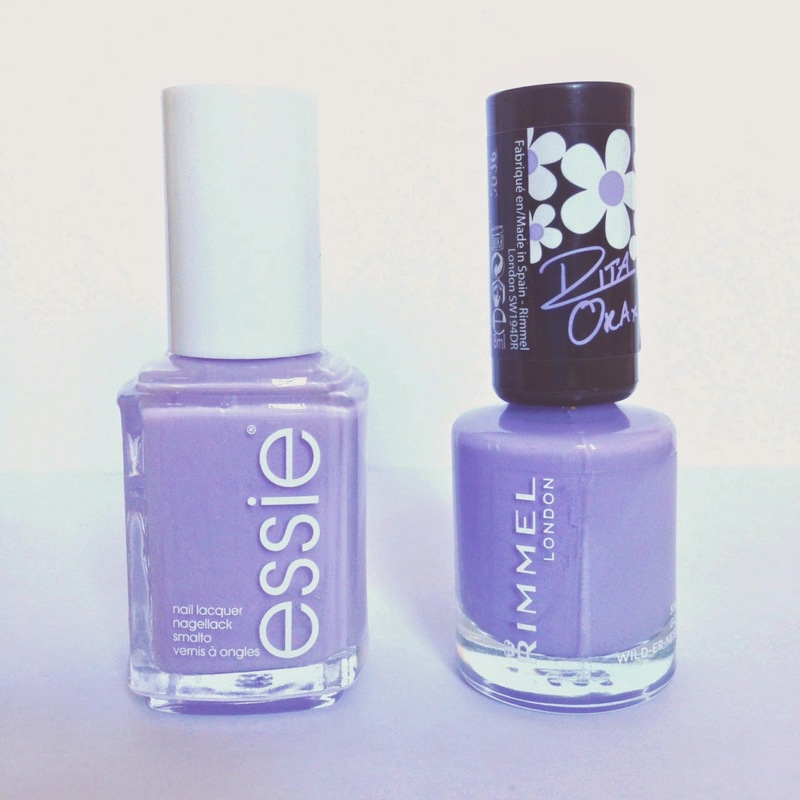 The Rimmel polish is definitely a deeper lilac than the Essie one, and has more blue/grey undertones. 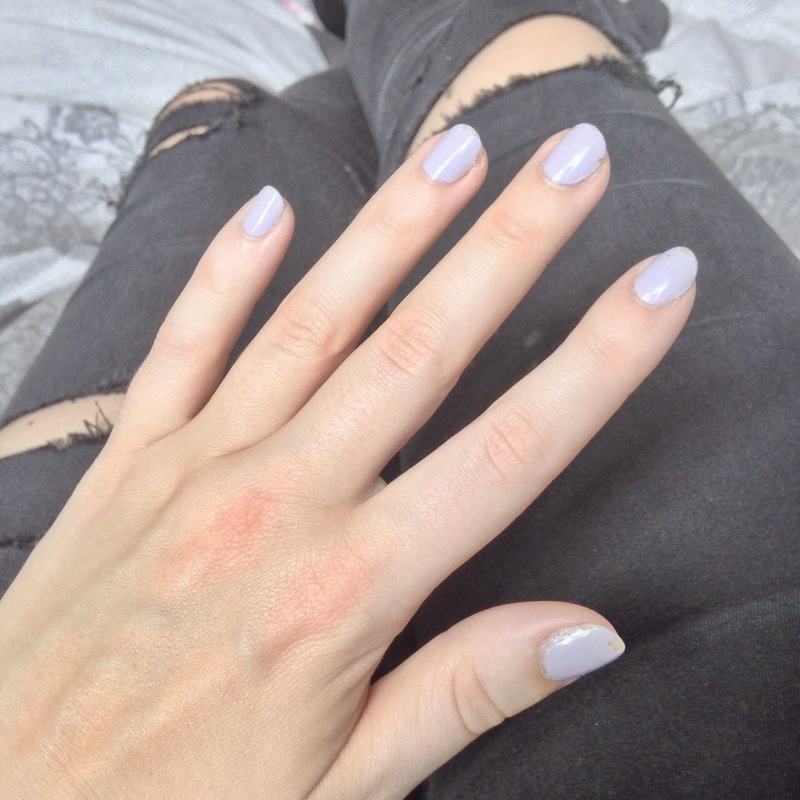 If you're looking for a truly pastel lilac colour, the Essie polish definitely gives you this, but this is not to say that the Rimmel polish isn't as nice! Both polishes gave a very smooth finish, but there is definitely some slight transparency left on my nails with the Rimmel polish - although this is only noticeable close up. I started to see a couple of small chips on both hands after day three. I don't know if this is just me but I often see my nail polish chip after day one or two so I was pretty happy with this! As you can see from the photo below, the Essie hand (top) was significantly less chipped by day five, so in terms of lasting power, I would say the Essie polish is superior - as you would expect from a more expensive polish (compared to the Rimmel polish). 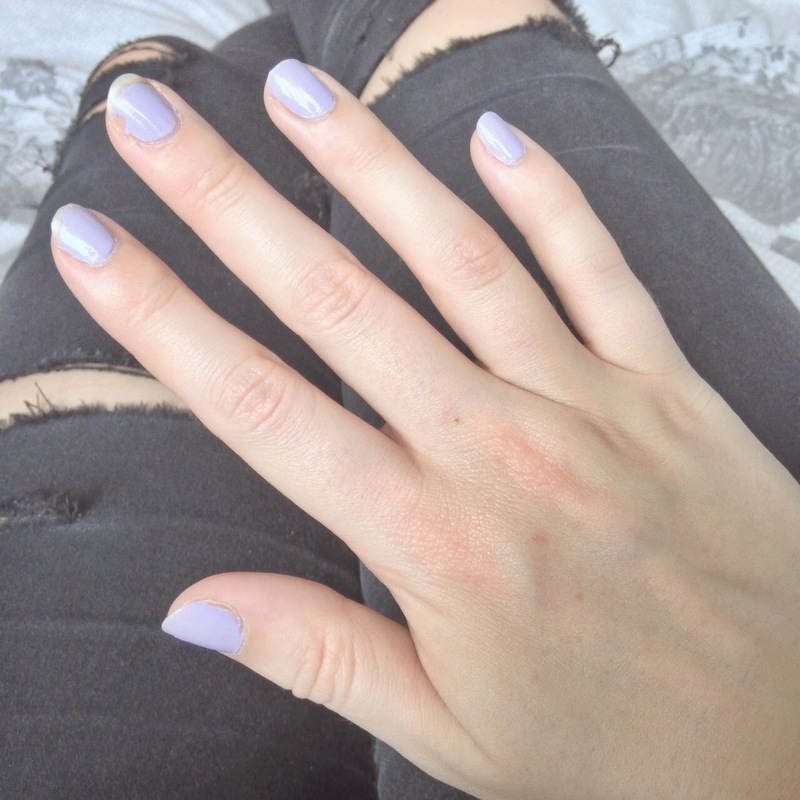 To conclude this lilac polish-fuelled battle, if you are on a budget then the Rimmel nail polishes are great value for money and they have a fantastic colour range to suit all seasons and occasions. If I'm being honest, I don't often keep the same colour nail polish on for more than four days anyway, and if you're the same then I would definitely recommend thenRimmel polish. However, now I've tried the Essie polish I am definitely going to be buying some more in my staple nail colours (does anyone else have staple nail colours? Colours that they ALWAYS end up reaching for? For me these include some kind of coral, mint green and a turqoise/blue) from the brand because of the stress-free application and the incredible lasting power for those times when you know you're going to be too busy to re-apply during the week (UPDATE: I've already bought 3 more). Have you ever tried these brands? What are your thoughts? Let me know in the comments! I loveeee the Barry M colour range, but they chip on my nails so easily! I think it's just me - I still continue to buy them religiously though!